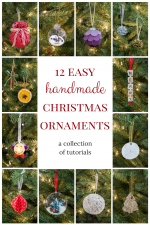 Home > Seasonal & Holiday > Christmas > Turn Holiday Cards Into Keepsake Ornaments! I love getting holiday cards every year! It’s a great way to keep in touch with family and friends who are far away, even if it’s just once a year. I already shared how we display our holiday cards each year, but what do you do with those cards once the holiday season is over? 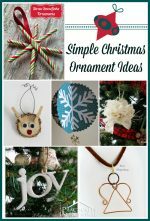 Today I’m going to share a quick and easy way to turn your favorite holiday cards into keepsake Christmas ornaments so that you can have them around year after year! Turn your holiday cards into keepsake ornaments! 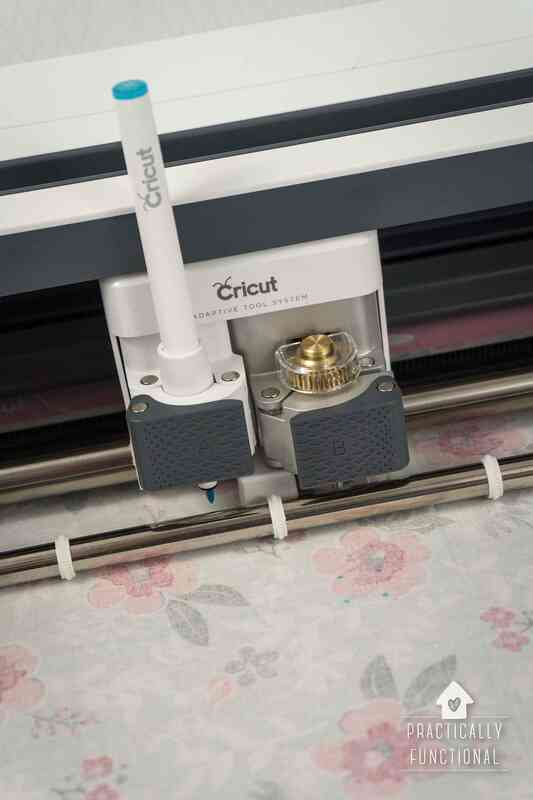 First trace 20 circles onto your card and cut them out. 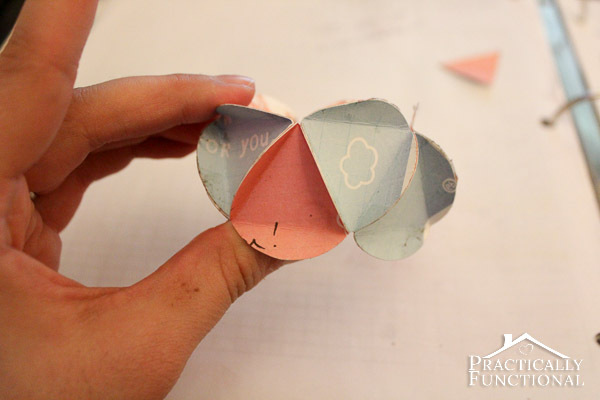 If you have a circle punch, that will work great, but if not you can use a pair of scissors. The diameter of the circle doesn’t matter; it can be whatever you want, but just make sure you can get all 20 circles before you start cutting up your card! My circles were about one inch in diameter and the finished ornament fits perfectly in the palm of my hand, so if your circles are bigger your finished ornament will be bigger too. 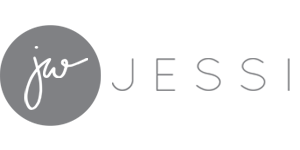 Inscribe an equilateral triangle (all three sides of the triangle are the same length) inside each circle so that all three points of the triangle touch the very edge of the circle. Then fold the circle along each of the lines of the triangle so that each circle becomes a triangle with three folded “tabs” on each side. 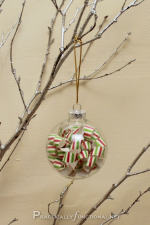 If you fold the tabs up towards the “front” of each circle (the side you want visible from the outside of the ornament) you will get an ornament with visible ridges at each joint, like the one in the photo above. 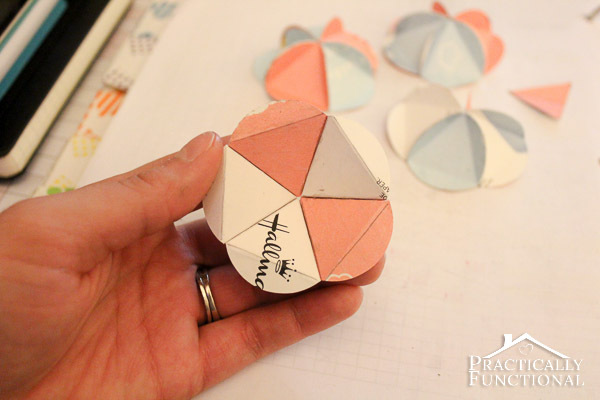 If, instead, you want the finished ornament to be completely smooth at each joint, fold the tabs down away from the “front” of each circle piece. 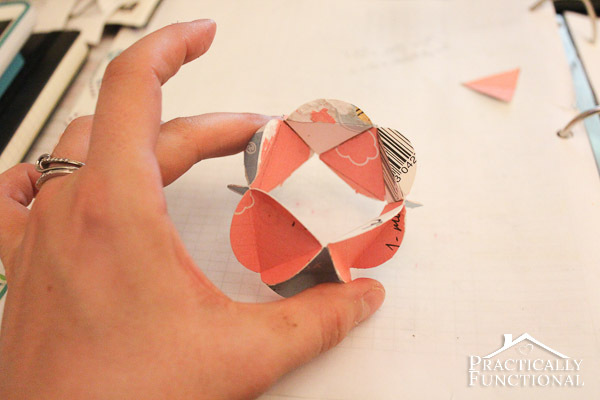 Take five of the folded circles and glue the tabs together into a flattened half dome, as in the picture below. Make sure to only put glue on the tabs and not on the triangle in the center. NOTE: If you would like your ornament to be smooth at the joints, you can follow these directions as written, just make sure that the tabs face the opposite way from what is shown in all of my photos. The tabs should all face “inwards” for a smooth ornament rather than “outwards” like in my photos. The underside of your half dome piece should look like this. Now take five more circles and make a second half dome piece in the exact same way. Cut a 10″ piece of string and fold it in half. Thread the folded string through the center of one of the half domes so that you have a loop of thread on the “outside” of the ornament and the two ends of the thread are on the “inside”. 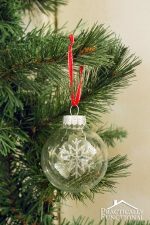 Tie a big knot on the inside of the ornament so the thread doesn’t pull through the center hole when you hang the finished ornament. Once your half domes are done, it’s time to start on the middle section. 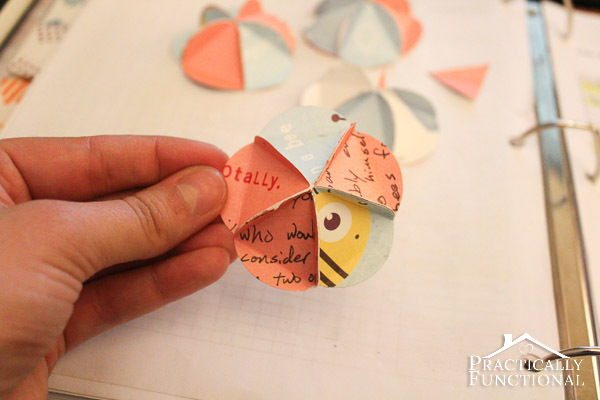 Take the remaining ten circles and glue the tabs together so that the triangles alternate facing up and facing down. It’s important to alternate the directions of the triangles so that you basically have a long, straight line of circles rather than a circular shape like the first pieces you made. Once all ten circles are glued together into a straight line, glue the two end tabs together to form a ring. Place one half dome on one side of the ring and line up all five of the tabs. Glue the tabs together, and repeat for the other half dome on the other side of the ring. Once you’ve glued all the tabs together, your ornament is finished! 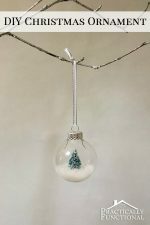 Hang it on your tree and enjoy your keepsake for years to come! What do you do with your holiday cards each year? How cute! I love that you could also punch out the signature or any sweet little note from the sender! Yeah, that was the fun part, making sure all the stuff written on the inside was captured and showed through in the finished ornament! My family always recycled old cards into gift tags. This is a fun idea! That’s an awesome idea Jenny, I love it! What a great way to make keepsakes of your Christmas cards! I have also done this with sympathy cards – we got so many when my parents passed, but I didn’t want to throw them away. 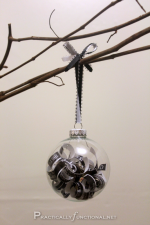 Instead I made some ornaments from select cards and gave to family members – a nice way to remember those who have passed. (also did with pet sympathy cards, and baby shower cards).